As an introduction to the bounty of Oregon – and Oregon cycling – the Willamette Valley Scenic Bikeway is a great way to go. 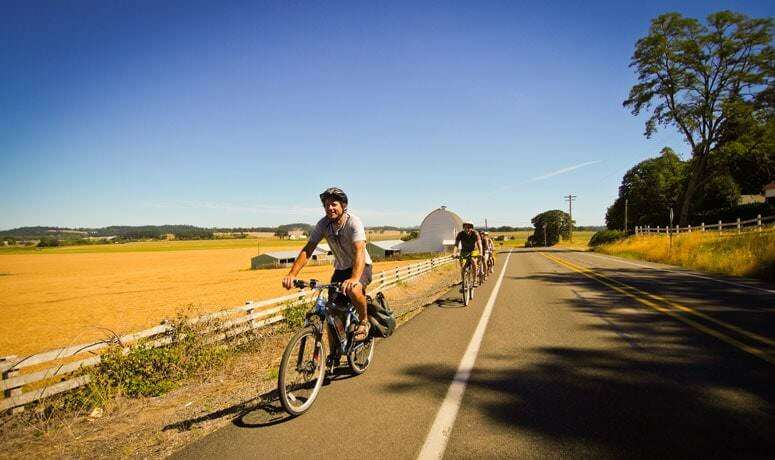 You can relive Oregon’s history, sample the agricultural bounty of the Valley, pedal through tranquil scenery and make your own history by riding the first official Scenic Bikeway in the United States. The Bikeway follows its namesake river as it winds through the Willamette Valley, shaped by the Coast Range to the west and the towering Cascade Mountains to the east. Over its 134 miles you’ll come to know why this valley is one of the most productive agricultural regions in the country, but you’ll also understand the natural beauty that frames and imbues the valley. 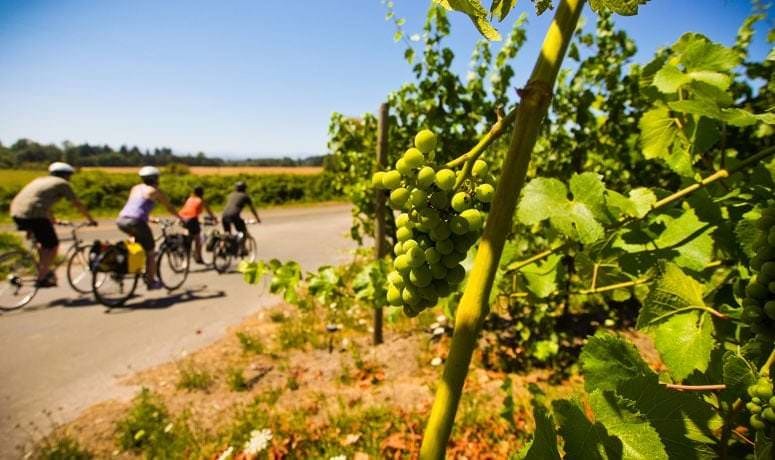 Cycle alongside fields of Oregon’s world-famous hops, past views of vineyards and through quaint towns. 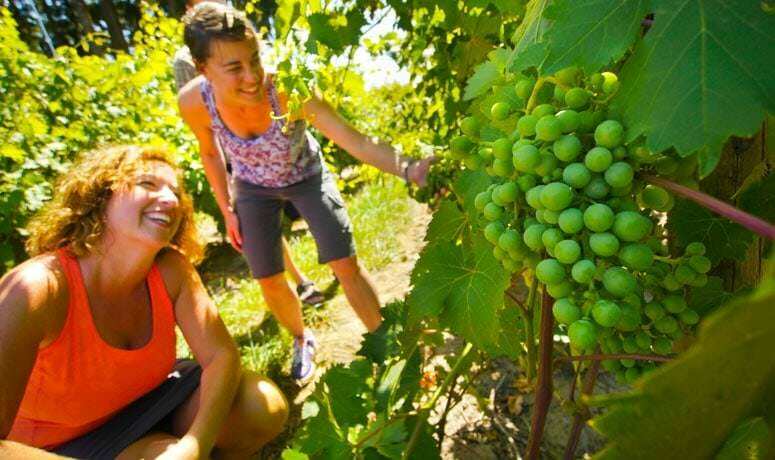 Stop for tastings at wineries and pick up supplies at coffee shops and brewpubs. The northern point of the Willamette Valley Scenic Bikeway is Champoeg State Park, where settlers gathered in the 1850s to hold what turned out to be a very close vote that led to the creation of the state of Oregon. After meandering along through small towns and past small churches and an amazing array of things growing adjacent to the road, the route passes Willamette Mission State Park – a great stopping point – and then cuts through Oregon’s capitol city of Salem. Once you clear the largest city on the route, you’re back into the natural world. As you pass through the Ankeny National Wildlife Refuge, honks and calls from wintering Canada geese are the loudest noises you’ll hear on this stretch. Continuing south, enjoy a long glide following the winding contours of the Willamette River on a quiet back road. After working your way through Albany and past Corvallis – a leafy university town worth exploring – head through more pastureland and grain fields to the picture-perfect town of Brownsville, with a campground conveniently located near its old-time downtown. The Bikeway’s one significant climb is the pass south of Brownsville, which rises 600 feet in elevation. Here you’re skirting up against the foothills that eventually transition to the Cascades; you’re enjoying a generally flat ride courtesy of the gap between the Cascade and Coast ranges. The route continues through the handsome town of Coburg before reaching its southern terminus at Armitage County Park and campground just outside Eugene. The valley’s temperate climate encourages year-round biking, so bring rain gear for winter riding; that rain is what makes this area so green. April through November bring sunshine, amazing flower displays and farmers markets full of hazelnuts, strawberries and marionberries, a fruit unique to the area. One-way complete ride: Riders can start at Champoeg for a multi-day ride. Call the park at 503-678-1251 for overnight parking arrangements. Riders can continue past the official end of the route, then continue to the Eugene Amtrak station and take the train back to Salem. From there, it’s a 30-mile ride back to Champoeg. Amtrak passenger train service stops regularly in Eugene with daily trips to Salem, Portland and California. Trains have a limited number of spaces to carry unboxed bikes. Amtrak reservations for passengers and bicycle storage space are recommended. Not all trains can accommodate unboxed bikes. Tandem, recumbent or other unusual bikes must be boxed. Folding bikes are sometimes allowed as a carry-on. For more information please contact Amtrak at 800-USA-RAIL (800-872-7245). Champoeg to Willamette Mission, a great 30-mile round trip. Both state parks have group camping facilities that allow inexperienced bicyclists to try an overnight bike tour. Carry your camping equipment on your bike the short distance of 15 miles to the next campsite. Albany to Shedd is a very flat and scenic 42-mile round trip. Armitage County Park to Coburg is a 13-mile round trip. A nice diversion — shown in the accompanying video— is to cross the Willamette River into the bike-friendly town of Independence after riding through Salem. 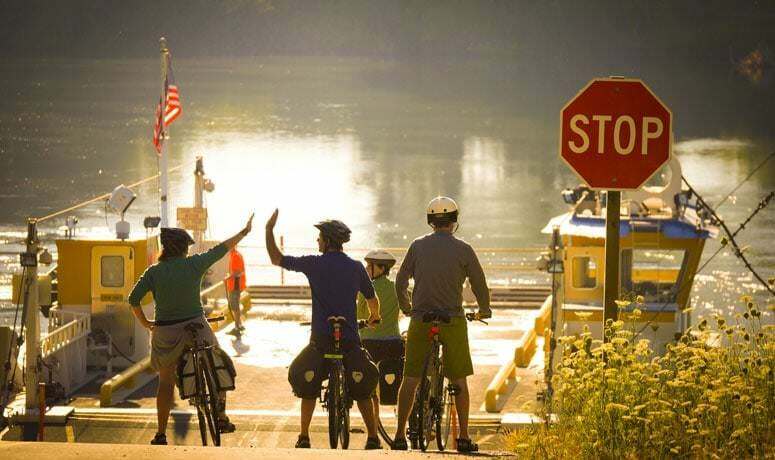 After a lunch break or a few winery tours on the west side of the Willamette, hop on the Buena Vista ferry from Buena Vista Park to rejoin the Bikeway. The first leg of the Willamette Valley Scenic Bikeway, this section from Champoeg State Heritage Area to Salem is mostly flat, following country roads through rich agricultural land. It’s a pleasant route for meandering. If you’re riding in the summer or fall, look for the hop fields; Oregon ranks second in the United States in hop production. Willamette Valley hops are shipped worldwide and are an important beer ingredient, especially in the Oregon style of IPA. Be prepared for rain in the spring, late fall or winter; the valley is known for its wet climate then. Bicyclists with good rainwear and a positive attitude can have a good experience all year ’round. Snow is rare, with only a few light snowfalls per year, typically. April through November brings drier weather, lots of flowers and warm days, making them the best months to ride. This is the second leg of the Willamette Valley Scenic Bikeway. The ride from Salem to Buena Vista runs along the Willamette River and passes the Independence Bridge. A short detour over the bridge will take you into Independence. The town features a large downtown park, restaurants and a bed-and-breakfast. Monmouth, just west of Independence, is home to Western Oregon University, a motel and grocery stores. South of the Independence Bridge, the route parallels the river and continues through the Ankeny Wildlife Refuge. Then the route turns east to Jefferson, once the mint-growing capital of the world. The town has restaurants and a small grocery store, but no overnight accommodations. Just north of Albany the route passes by a paper mill. Expect an increase in traffic here. This is the third of four legs of the Willamette Valley Scenic Bikeway. Leaving Albany, the route quickly returns to a country setting south of the city. The route is generally quite flat and offers views of cultivated fields, acres of rye grass and the Willamette River. Whether you’re stopping here for the night or just passing through during a longer ride, Albany has a bicycle shop, plus many restaurants, hotels and B&Bs. The final leg of the Willamette Valley Scenic Bikeway, this is also the most challenging. Before you set out, Brownsville has several nice cafés and a city park with campsites. The town is a perfect place to relax on a bench on Main Street or in a café. While relaxing, ready your legs for the longest climb of the entire route, which begins just south of Brownsville. Once you crest the climb on Gap Road and descend the other side, the rest of the ride is a gradual uphill to your final destination, the scenic Armitage County Park. Other than the one big climb, this route is not that challenging; it’s appropriate for intermediate riders. 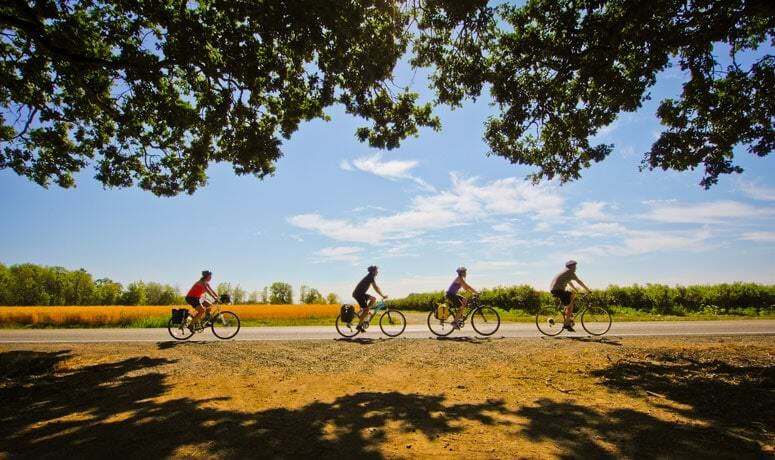 Find more to see and do near this Scenic Bikeway at Oregon Wine Country and Travel Salem. Champoeg State Heritage Area and Willamette Mission State Park offer camping with hiker-biker sites and restrooms. Restrooms can also be found at Thompson’s Mills State Heritage Area. 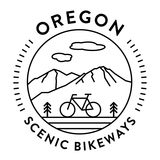 Order a free copy of the Oregon Scenic Bikeway map and start exploring the best routes that Oregon has to offer — all from the seat of a bike. In addition to visiting TripCheck.com, please contact the Marion County Public Works department at (503)588-5036 or the Linn County Road Department at (541)967-3919 for current information about road conditions.